We have such a varied selection of wild birds in the UK that need our help, especially over the Winter months. Bird care is an important business and we stock the products to help you to help the birds. 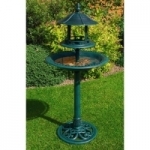 We sell cheap bird tables, ornamental bird baths and wild bird feeding stations. In addition, we also stock cast iron bird boxes and squirrel guard bird feeders to help protect the bird from predators. These cheap bird care products make a great gift idea and can be delivered on a next day delivery.